The decision by the British government to give Nazanin Zaghari-Ratcliffe formal diplomatic protection marks a significant escalation in the UK's campaign to secure the release of the British-Iranian dual national who is detained in Tehran. It is an extremely rare diplomatic and legal move that signals the UK is no longer treating the case as a consular matter but a formal, legal dispute between Britain and Iran. It means that the government believes Iran's treatment of Mrs Zaghari-Ratcliffe - her lack of access to due process and medical treatment - has failed to meet international standards. As such, she should be given the formal protection of the British state. So when British diplomats raise her case with Iranian counterparts in the future, they will no longer be representing just the interests of a UK citizen but also those of the British state. This theoretically opens up the possibility of Britain taking some kind of international legal action against Iran. This could range from requesting inquiries, demanding negotiations, even suing for compensation for an "internationally wrongful act". But Foreign Office sources indicated they were unlikely to go down this route. Few diplomats want the case snarled up in the International Court of Justice for many years. Instead, the assertion of diplomatic protection will give the UK new ways of raising the case of Mrs Zaghari-Ratcliffe in international forums like the United Nations. Most countries prefer to avoid getting involved in bilateral rows about complicated consular cases. But now this has been elevated to a formal state-to-state dispute, Britain can look for allies on the international stage to put collective pressure on Tehran. It is not the same as the diplomatic immunity given to envoys and diplomats to ensure their safe passage and protection from prosecution in a foreign land. And the mechanism cannot be used to force Iran to do anything. Foreign Secretary Jeremy Hunt said that diplomatic protection "is unlikely to be a magic wand that leads to an overnight result". But he said it showed the whole world that "Nazanin is innocent and the UK will not stand by when one of its citizens is treated so unjustly". Officials say Iran does not like being put under international pressure. And there is always a risk that this plunges relations between Tehran and London into the deep freeze. This is one reason why the British government has, until now, been reluctant to play the diplomatic protection card, fearing that it might make things worse. 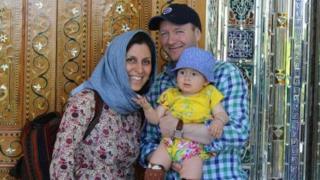 But diplomats say that the lack of any progress and the refusal of Iran even to give Mrs Zaghari-Ratcliffe the proper medical treatment she needs has left them with little choice but to escalate. They say Iran will not be surprised by the British move. The question is whether it will respond positively to the pressure or step up the confrontation.